Take Control of Your Local Search Listings Now! Are you sure that those searching for your business are getting the correct information? Do a quick search for your business name using Google, Bing, Yahoo or your other favorite search engine. Hopefully you have a website that is listed at or very near the top of the organic SERPS (Search Engine Results Page) rankings. You will likely also see several instances of your business name in the results. The web has a myriad of companies providing local listings of businesses. The vast majority of them generate those listings using bits and pieces of information by scraping the web. These services can either help or hinder your businesses with the information they display in Google or other SERPS (Search Engine Results Page) rankings. More often than not, one or more of the services will have an incorrect phone number or address, or out-dated hours of operation. You need to “claim” each of these listings and control what is displayed. It is a huge mistake not to do so. Start with Google+ which, because it is connected to all things Google, simply cannot be ignored. Do the rest as you have time, but definitely Bing, Yahoo, and Yelp. There are others as well, but claiming and filling out your listings for these will help you considerably. Please know that you do not have to do any more than the “free” listings. Do not fall for their upsell, unless you have a very large advertising budget. There are better values for your ad dollars. Also, please do not fall for the “We’ll list you in 40 Local Directory sites.” or similar pitches. You do not need to be in 40 local directories. This is not a “local listing” suggestion, but worth mentioning here. Most of you should have a LinkedIn Company Page. Why? They simply do very well in SERPS, and they don’t need a lot of maintenance. I didn’t mention Facebook, but hopefully you know whether or not a Facebook page is right for your business. If it is, by all means create one. It will help you locally. If it is not a really good fit, don’t waste your time. So, take the time, and Take Control of Your Local Listings Now! Here are some quick links for you. Time of Day and Devices for Opened Emails – Time matters! Wondering when you should send your email newsletter? We have some quick answers for you. As you might suspect, the day of the week and time of day both matter. 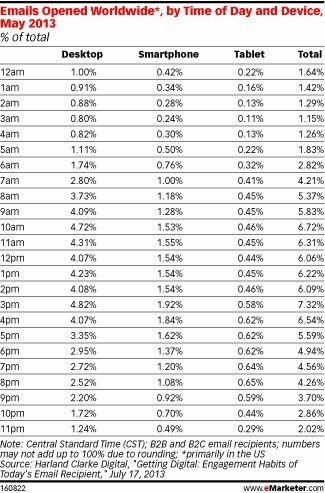 Check the table to see how these actual “opened” times compare with your email send times. The 3:00 p.m. numbers may surprise some of you, as they did us. When do you send your email newsletters? Time matters!